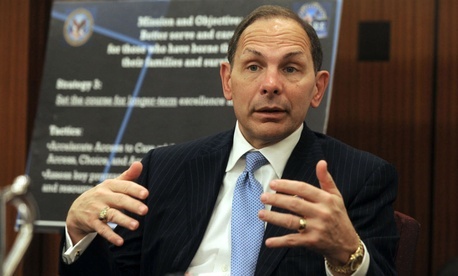 Veterans Affairs Secretary Bob McDonald on Monday outlined the progress his scandal-plagued department has made in the last three months, in what he touted as the beginning of the largest restructuring in VA’s history. The so-called “Road to Veterans Day” plan, which McDonald has repeatedly highlighted during the past 90 days in multiple public and private appearances nationwide, is the first phase of a wide-ranging, long-term department reorganization designed to rebuild trust with veterans and improve their access to services and benefits. With his “MyVA” approach, the former chief executive officer of Proctor and Gamble is bringing the business world’s laser-like focus on the customer to a government agency known for intractable bureaucracy. “We call that reorganization ‘MyVA’ because that’s how we want veterans to view it,” said McDonald at a Washington Post event the day before Veterans Day to discuss vets’ postwar careers and contributions. He said the department so far has reduced the national new patient primary care wait time by 18 percent, managed to roll out the first phase of a “choice” program that allows vets faster access to private health care rather than waiting for a VA appointment or traveling several miles to a VA facility, and scheduled more than 1.2 million more appointments in the last four months than in the same period in 2013. McDonald has traveled the country extensively since he took over at VA this summer, visiting 41 facilities in 21 cities and making 11 recruiting visits to medical schools. McDonald said the VA needs roughly 28,000 new medical personnel to expedite vets’ access to quality health care. The department also has reduced the disability claims backlog by 60 percent in the last 20 months and completed 1.3 million claims for vets so far in 2014, according to McDonald. In the next few weeks, VA will release a request for proposals for acquiring new appointment scheduling software. Delays in wait times for vets seeking health care across the country as well as an attempt to cover up those shortcomings in some VA facilities came to light this past spring, and sparked the massive management overhaul. Still, McDonald has his work cut out for him, particularly when it comes to finding a balance between firing employees engaged in improper or illegal conduct and respecting employees’ due process rights, a cornerstone of civil service. Last week McDonald once again defended his commitment to holding employees accountable and firing them when necessary, but also according to the law. Responding to criticism that the department has been too slow to sack top leaders involved in falsifying patient care documents and other controversies, McDonald last Thursday said the VA is “moving as aggressively and as expeditiously as possible” and that the department is tracking more than 2,000 employees for possible disciplinary action. That number includes the 40 or so cases of senior executives under investigation for wrongdoing. “We have to make sure whatever disciplinary action we take sticks,” McDonald told a group of reporters at a Washington breakfast sponsored by The Christian Science Monitor. “That it’s fair, that it sticks and upon appeal, it’s successful.” On Sunday, McDonald said on CBS’ “60 Minutes” that roughly 1,000 of those employees deserve some kind of disciplinary action, including firing. The department employs approximately 315,000 workers. While some, including many lawmakers, still think the department isn’t moving fast enough on rooting out the bad apples, federal employee advocates find the push to fire worrisome. The controversial firing provisions in the new law Congress passed this summer could make recruiting difficult, SEA and others argue. The 2014 Veterans Access, Choice and Accountability Act, passed in response to several whistleblower allegations that VA employees falsified documents related to patient care, allows the department to fire and demote Senior Executive Service employees immediately, with paychecks getting cut off the day of the termination. The affected executive would then have seven days to issue an appeal to the Merit Systems Protection Board, which in turn would have 21 days for an expedited adjudication. MSPB’s ruling would be final. Prior to the new law, the VA already had the power to remove senior executives who receive unsatisfactory performance ratings under Title 5 of the U.S. Code. Removal can mean termination or a demotion, under Title 5, which says that senior executives in federal agencies must be removed from the SES if they receive two “unsatisfactory” ratings within five consecutive years, or two “less than fully successful” ratings within three consecutive years. To begin the removal process, the agency must provide a 30-day written notice to the employee outlining the action. The Merit Systems Protection Board can review the action and make a non-binding recommendation to the agency; however, employees cannot appeal the actual performance rating, resulting in removal from the SES. As part of the department’s reform effort, McDonald also said he has made it very clear throughout the organization that he will not tolerate retaliation against employees who criticize the department or blow the whistle on wrongdoing. “We want every employee to be critical of our operation,” he said during The Christian Science Monitor breakfast. “I want people working to help improve our operations from the lowest level to the highest level.” As part of the MyVa plan, the department has launched an intranet web tool, the MyVA Idea House, where employees can submit suggestions online to improve services and streamline processes, as well as vote on colleagues’ ideas. The VA also announced last week that it has created “a new award program” to highlight employees who embody the department’s new credo – ICARE (Integrity, Commitment, Advocacy, Respect and Excellence). The VA will begin accepting nominations for that program in January.